NOTE: It is difficult to describe Virginia's aboriginal cultures without violating some aspect of modern political correctness. This Web site uses Native Americans, First Virginians, Indians, and other terms. Inevitably, some readers may take umbrage at one or more of the labels. Perhaps in the future, we'll reach a stage in our own cultural development where examination of the patterns of other societies will be considered a way of honoring another culture. The reader is requested to suspend efforts to find fault with inadequate terminology, and emphasize instead an appreciation of the effort required to understand the differences and appreciate the similarities among cultures. The first human residents of Virginia left virtually no written materials about their culture. We don't have the diaries, reports, or other records of a "literate" society as source material for understanding a different culture, in a different time. We have to evaluate other evidence to determine - or guess - at their religious beliefs, political boundaries, population levels, family life, and other social patterns. The physical evidence still available for study - shards of pottery, animal bones, postholes of houses, etc.- are subject to interpretation. English listeners recorded the words spoken by Powhatan. 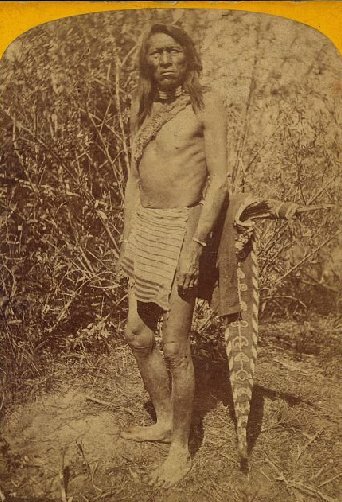 (He was also called Wahunsenacawh or Wahunsunacock, as recorded by the English immigrants in the early 1600's - spelling of the original Virginia names by the English is not 100% consistent.) His words are not first-hand records; they were not written directly by Powhatan himself. In addition to the inevitable errors in translation, the written records of the Europeans must be viewed in the context of the 1500's and 1600's rather than the first decade of the 21st Century. The early English were not necessarily "New Age, sensitive kinds of guys" who made anthropologically-neutral observations. The first Europeans to explore Virginia filtered what they saw through their world view. The vast majority of English explorers/colonists who came to Virginia were Protestants and nationalists. The idea that there should be a separation between church and state, that government should be secular and individuals left free to choose their own personal faith, was far in the future. The Europeans who arrived in Virginia considered it a natural way of life that the English would displace the Native Americans, as well as prevent settlement in Virginia by French and Spanish Catholics. The "pagan" culture of the Natives was described by those educated enough to read and write in the early 1600's. Those recorders were not 100% neutral; they had been thoroughly exposed to the religious and political bias of their time. The descriptions of the early explorers include overt and hidden value judgments that shade our current understanding of the lifestyles of the First Virginians. When you read the original documents, try to anticipate the source material that was omitted as well as the way the recorded material was morphed by the biases of the colonial times. Modern historians, scientists, and students are affected by cultural biases as well. For example, do you assume the ability to read and write (literacy) is fundamental to intelligence? Do you notice spelling errors in documents, and discount the quality of the thinking because the writing was flawed? If so, then you may be consciously or unconsciously assuming that the Native Americans were not intelligent. If so, be consistent and assume Shakespeare was not intelligent - because his spelling was inconsistent. 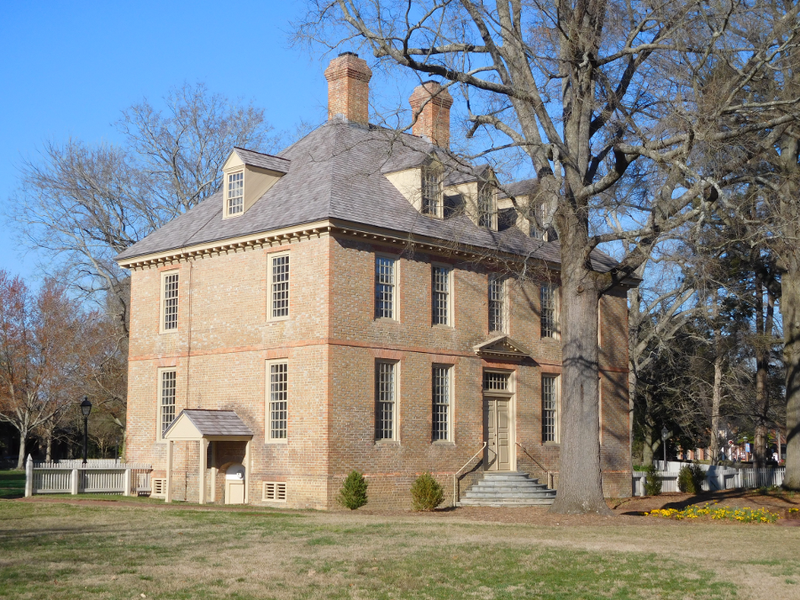 If you visit one of the colonial Virginia mansions, tour guides will talk about the Carter, Lee, Randolph, Bolling, and occasionally even the Grymes family as "First Families of Virginia" (FFV's) The FFV's were the gentry - the white, Anglo-Saxon, Protestant gentry - who governed the economic, social, and political life of colonial Virginia between 1607-1776. "Colonial" is the time between when Jamestown was settled in 1607 and 1776, when a special convention of colonial leaders declared Virginia to be an independent state. 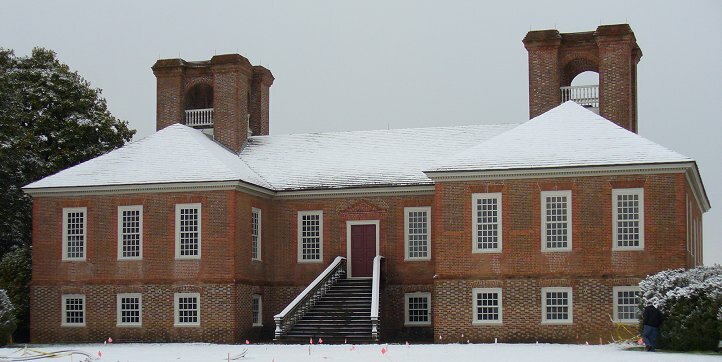 Men controlled the Virginia General Assembly and local county courts in colonial times. No women and no slaves (male or female) could vote. Political and economic power was not shared or spread around any more than necessary. The sons and daughters of FFV families married sons and daughters of other FFV's, and inherited wealth - primarily land and slaves, both considered necessary property for growing tobacco that was shipped to Europe - stayed in the family. The oldest male son inherited the majority of the family wealth, a pattern known as primogeniture. Inherited land was kept within family control for generations, entailed by the wills of long-dead ancestors. In modern Virginia, especially in rural areas of Tidewater and Southside and in the West End suburbs of Richmond, being related to one of the early colonial families is a badge of honor. These FFV's think "To be a Virginian either by Birth, Marriage, Adoption, or even on one's Mother's side is an Introduction to any State in the Union, a Passport to any Foreign Country, and a Benediction from Above." Despite such traditional Virginia gentry myths, the very first FFV's did not speak with a British accent. The earliest human residents in Virginia probably walked here from Asia through Alaska, after crossing a land bridge hundreds of miles wide known as Beringea. the first Virginian would not have resembled this individual, because the climate 15,000 years ago was colder. When the English immigrants got to Virginia, they were greeted by the real "first" Virginians. The next time someone argues about the discovery of America by the Vikings from Scandinavia, or suggests the English had a legitimate claim on the area by Right of Discovery because it was unoccupied by any Christian prince, or challenges the presence of immigrants from foreign nations - remember that Virginia was discovered and occupied first by people who did not speak English. We do not have enough evidence to prove beyond a reasonable doubt when humans first came to Virginia, or how they got here. The traditional view, that Asians walked across the Bering Land Bridge, may be expanded to include arrivals from other directions. We can be positive about one thing, however: the first Virginians did not arrive in the Susan Constant, Godspeed, and Discovery in 1607. About 25,000 years ago, so much water was captured in the ice blanketing the continents that sea level was as much as 400' lower. Lower sea levels exposed the land now under the Bering Sea. Until 14,000 years ago, there was still wet-but-walkable ground that connected modern-day Alaska with modern-day Russia. For over 50 years, scholars thought the first artifacts documenting human settlement in North America were stone tools crafted in the style of the Clovis culture. 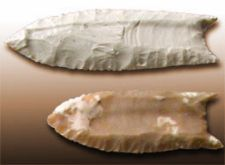 The tools were first discovered in the 1930's near Clovis, New Mexico and dated to be about 13,000 years old. Recent studies in the last 30 years show clear evidence that there was a pre-Clovis culture, one that arrived in North America as early as 15,000-20,000 or so years ago. Some archeologists still question if Virginia was occupied by humans before the development of the distinctive stone tools of the Clovis culture. Critical thinking skills are required when someone states anything related to Virginia before 1600 as "true." What we know today may not be what we believe tomorrow, as new evidence surfaces and new interpretations are based on new evidence. In 1996, a skeleton was discovered on the Columbia River in the Pacific Northwest. 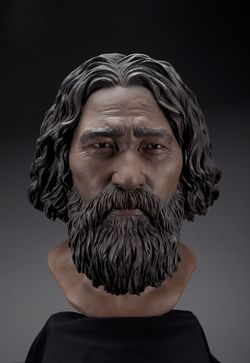 "Kennewick Man" was radiocarbon dated at roughly 9,000 years old. The Federal government planned to turn over the bones to a local Native American tribe for burial, following the 1990 Native American Graves Protection and Repatriation Act. 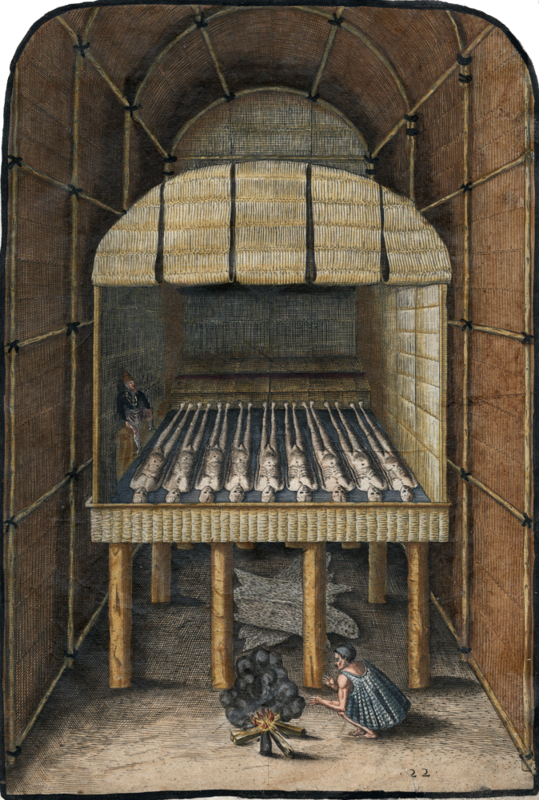 That law mandates that ancient human bones must be turned over to the most closely-allied tribe for reburial. That study led scientists to conclude that Kennewick Man was a traveler from Alaska, someone who drank water from glaciers and ate marine animals such as seals, sea lions and fish. Though the bones were found inland from the Pacific Ocean shoreline, he was a maritime hunter-gatherer who originated with the same group of people that later populated Polynesian islands and Japan. Members of that group may have paddled along the shoreline of Beringea 9,000 years ago to reach different hunting grounds on the coastline of North America, and some may have gone inland for brief visits to trade for different types of stone tools and food. Native North American women and men domesticated local plants, including the wild ancestor of squash and several highly nutritious seed crops, long before any domesticated plants were introduced from Mesoamerica. This revolutionary contribution of Native North Americans makes eastern North America one of the world's four major independent centers of plant domestication along with the Middle East, China, and Mesoamerica! Even assumptions about Native American origins for Virginia place names are changing. Maybe Shenandoah really does mean Daughter of the Stars, but evidence for that claim is thin. Layers and layers of Virginia tradition may be repeated often by tourism officials, but still lack primary sources. Chesapeake, name of the largest bay in Virginia, is of Native American origin. 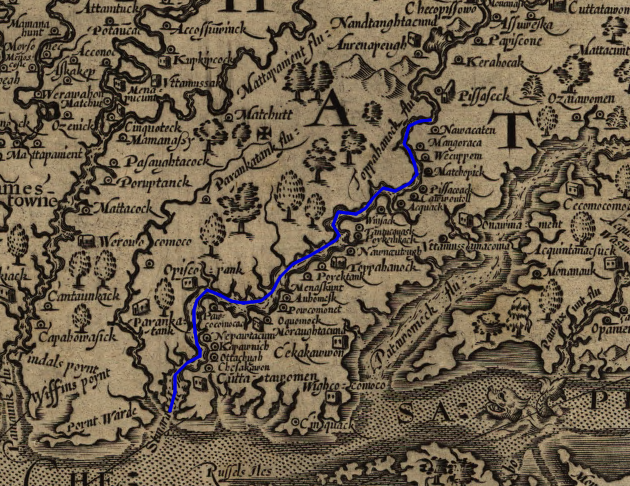 Roanoke, Meherrin, and Nottoway are Native American names for Virginia rivers, but they were not the original names used by the first Virginians. Place names used by Native Americans in the early 1600's (before the Europeans arrived) had little or no relationship to the first names assigned to those places by the first settlers who arrived as much as 15,000 years earlier. Paleo-Indians did not speak Iroquoian, Siouan, or Algonquian languages. 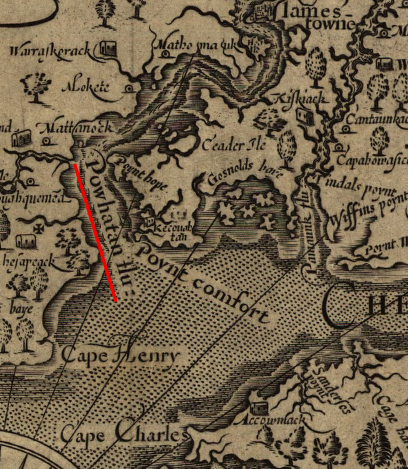 The English changed the name of Powhatan's River to James River to honor a ruler in London, but a name change for that natural feature was not new. The Native Americans under Powhatan's control would have used the name Powhatan's River for just the last 30 or so years. Perhaps the name of the previous paramount chief who ruled prior to Powhatan had been assigned to that river, or perhaps it had been called something as mundane as "Big River." The English referred to Virginia rather than Tsenacomoco, the term used by Powhatan's Algonquians to describe the region where they lived. What was the first name for the place we now call Virginia? No one knows; the Paleoindians left no records providing any clues to their languages. What we do know is that the first Virginians, maybe 15,000 years ago, did not speak the Algonquian language or have a chief called Powhatan. 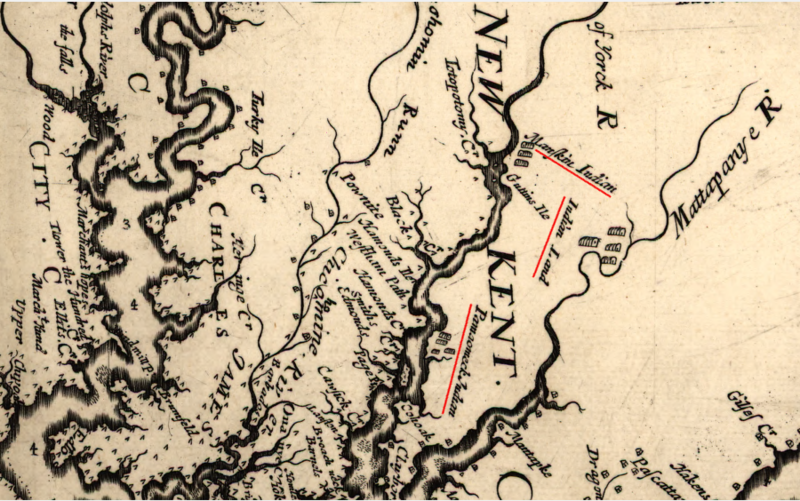 The original names of the Virginia rivers recorded by John Smith on his map of Virginia were not the first names ever used, so efforts to "restore" the place names of Virginia must deal with the fact that we do not know the first names that were used. Where Are the Natives in Virginia Today? from November, 1998 Scientific American: "Tool Time On Cactus Hill"
Council of Virginia Archaeologists, Inc.
Virginia Foundation for Archaeological Research, Inc.